Konami has unleashed a flurry of new art, screens, and information on Suikoden: Tierkrieis, the game that takes the hunt for the 108 Stars of Destiny to the Nintendo DS. Due out in March of next year, Tierkreis promises all of the gameplay elements fans of the franchise know and love, along with a "rich online community experience" utilizing the Nintendo Wi-Fi connection. Players will be able to send their characters on quests that other members of the community will complete for them, basically allowing for a giant community quest-pool. Once your character has made the rounds, they return to your game with a wealth of experience and treasures galore. It's a freaking communal RPG. I love it. 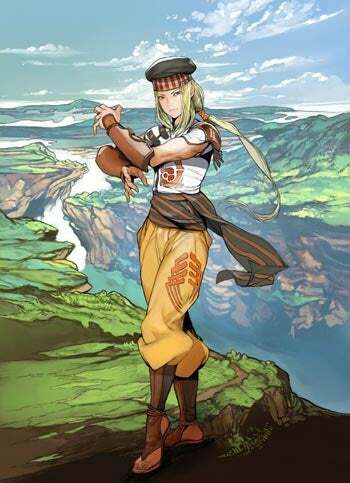 I also love the classic Suikoden art style, which if definitely represented here in all its clean and simple glory. Hit the jump for screens, character art, and a fact sheet chock-full of handy information.